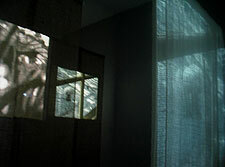 The BMAC's "Inside-Outside" installation pairs its soundtrack with photography and video images projected onto fabric. 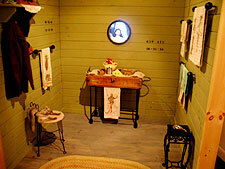 The BMAC's "Looking for Betty" invites us into Everywoman's kitchen. The super-sized, blue "TianDi PiaoYang" banner outside the C.X. Silver Gallery in West Brattleboro pays homage to the Tibetan prayer flag and Mongolian ceremonial sites. Flickering light, movement, imagery. Everyday sounds woven into artwork that the viewer can step into or around . . . .
Three institutions in Brattleboro offer installations for the public to explore throughout the spring and summer: Brattleboro Museum and Art Center, C. X. Silver Gallery, and Vermont Performance Lab. In a series of three installations over the past year, the Brattleboro Museum & Art Center (BMAC) has been presenting works that allow the viewer to enter the space of the artwork while taking in ambient sounds. Alisa Dworsky's "InTension" (December 2007-March 2008) used crocheted polypropylene netting and gravity to create a hutlike space. Through an inversion of shadows, the bright yellow material transformed an everyday place into a universal sanctuary for museum visitors. In the BMAC's current exhibition, "Inside-Outside," Dianna Rust's projected photography and Walter Ungerer's video combine with veils and partitions of burlap and gauze that create a maze for the viewer to weave around in among the flickering images and everyday sounds. Beams of light from two opposing projectors send barely recognizable images of room interiors and backyard exteriors onto fabric whose textures are magnified onto the walls. Sounds come and go: a dog barking in the distance, whispers, a radio program, windchimes, a vacuum cleaner. In another current exhibition, a mirror-shaped video within a simulated kitchen focuses on the everywoman in Looking for Betty that artist Julia Morgan-Leamon describes as with "many hairstyles," of "all races," and living "within every female body -- a victim of war and social marginalization." Pop standards of the 1940s serve to fashion the scene as being both in the World War II era and in the present day. Two miles from the Museum, via Route 9, passersby see TianDi Piao-Yang outside the C.X. Silver Gallery. TianDi means 'sky and ground' or 'heaven and earth.' PiaoYang means 'the flowing of the wind.' Twenty-three 70-pound bags of tube sand form the Earth-Raft-Mountain-Cairn. Cut from a tarp, streamers emerge from the pile and head skyward. The installation can be viewed from the sidewalk, lane, and porch. 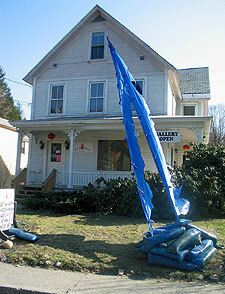 With blue fabric strips available in the Gallery, the community is invited to adorn the streamers. The verticality, angularity, and windborne movement and sound of the form and its blue color symbolize the water cycle between sky and ground. Artist Xi Cai explains the installation as "an hommage to the Tibetan prayer flag and Mongolian ceremonial sites. It is also about Qi (ch'i), the rhythmic vitality, movement, and inner energy through which comes the harmony of Heaven and Earth, and which imbues people and things with breath, soul and spirit." Straddling Bellows Falls and Brattleboro is Vermont Performance Lab's (VPL) upcoming "Music for Trains." VPL director Sara Coffey explains: "The Music for Trains project will be inspired by the sights, sounds, and stories of Brattleboro and Bellows Falls, and the railways that connect them. The members of So Percussion, who are creating the work, are approaching the performance like an installation work. At the Brattleboro performance site -- the site of the future Union Station -- the artists will transform the space through music, sounds, and video projections. At the Bellows Falls site, the artists will play off of many of the visual images of existing railcars and the arch over the Waypoint Welcome Center and incorporate their sounds into the live performance. The musical score for the rail ride will be inspired by the train journey itself -- its sights and sounds." "Music for Trains" has activities throughout the next few months, including residencies, workshops, and concerts to engage young performers from Brattleboro and Bellows Falls. These activities will also be opportunities to collect and record sounds that will be part of the two-day final performances on August 8 and 9 in and between the two towns. These three arts organizations are presenting projects that find different ways to present their common interest in interacting with the public through everyday sounds, subtle movement, and imagery from different physical viewpoints. More details are on the websites of the three organizations: brattleboromuseum.org, cxsilvergallery.com, and musicfortrains.com, as well as the Rockingham Arts & Museum Project site, ramp-vt.org.